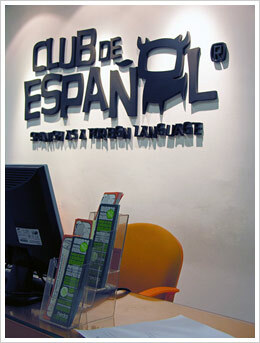 Our Spanish language school, Club de Español, is located in Chamberí, an exclusive neighbourhood in the very heart of Madrid, and one of the most luxurious and fashionable areas of the capital, just 5 minutes from Colón square and Castellana Avenue, one of the beautiful main arteries of the capital. From this central location, you can take a stroll down to many art galleries, shops and historical buildings. The Spanish language school is within a short walking distance from a number of metro stations and bus stops. Enjoy our friendly atmosphere in the recreational areas where you can relax and have a coffee or snack between classes or make use of our cyber café service where you can get connected at any time. Have a look at our international specialised bookstore where you can find everything from Madrid guides and roadmaps to the most recent best-sellers in Spanish, as well as Spanish textbooks.